With the state of the world today – diminishing oil supplies, global warming, acid rain, and so forth - it’s no surprise that everyone is going green. With high gas prices and the current economic climate, people are looking for ways to do more with less, leaving as little impact on the environment as possible. FIGURE 1. 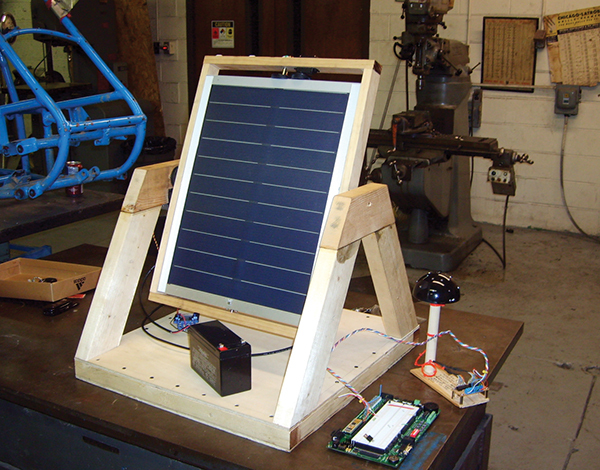 Solar Tracker on my robotics shop (i.e., basement) workbench. Phrases such as “going green” and “carbon footprint” have become ubiquitous and even trendy. The United States Green Building Counsel (USGBC) has even developed a green building rating system called LEED by which new buildings are designed to be as energy efficient as possible. Those with the knowledge to innovate technologies for renewable resources might soon find themselves highly sought after! Once a week, we met with Dr. Stephen Goodman, Ph.D., Senior Design instructor and Chair of WVU Tech’s Electrical Engineering department. For the first few weeks, we did nothing but brainstorm for ideas. 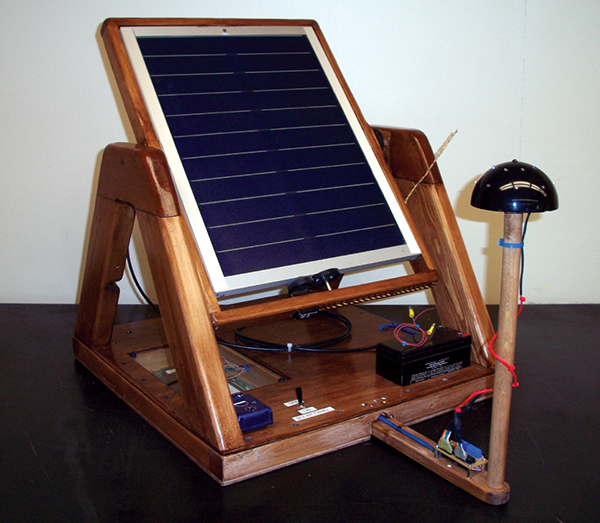 Our first proposal was a solar power supply for laptops to be used during camping/beach trips. Unfortunately, it was determined that the size and weight of such a contraption would be impractical, and our solar panel simply couldn’t produce the wattage necessary to power a laptop. After several other scrapped ideas, we settled on the wackiest one of all: a solar-tracking power supply for a mobile unit (Figure 1); a device that not only provides power to sustain its own functions (tracking the sun for optimal energy collection), but also for propulsion and steering of an unmanned vehicle. Fortunately, we didn’t have to design the mobile unit. We only had to design the solar tracker, with the provision that it have enough energy left over (stored in a battery) so that it could power a mobile unit. Many tests were run on all three candidates. Our solar panel only produced 20 watts of energy, so actuator power consumption was heavily weighted. Torque and accurate positioning were also paramount. 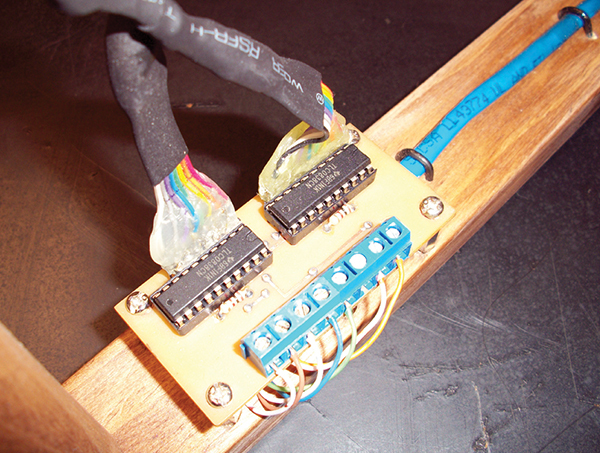 As it turned out — much to my dismay — servos were determined to be the best candidate solution. They are internally geared down, providing adequate torque to move the solar panel. Servos also have internal circuitry which provides negative feedback for accurate positioning — saving us from having to design an external feedback device (such as an optical encoder). They also consume less power than stepper motors. 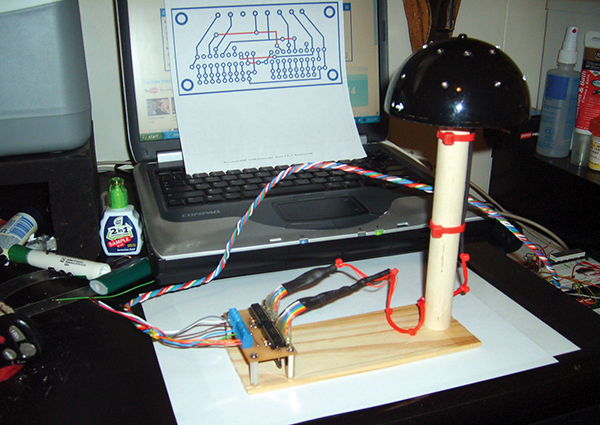 So, though I didn’t get to use my custom stepper motor driver, I did learn a lot about servos. FIGURE 2. 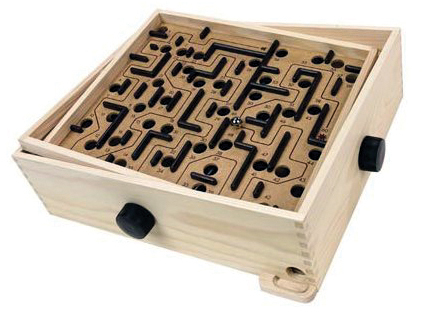 A labyrinth toy. Okay, remember the three basic elements of a good, interactive machine that I mentioned earlier: input, processing, and output? Think about it like this. Say you want to pick up an apple. First, you look around (input). Light is reflected off of everything around you and into your eyes. Your retinas receive the light and send electrical impulses to your brain, which interprets those signals allowing you to locate the apple (processing). Your brain then sends electrical impulses to your muscles, directing your hand to pick up the apple (output). FIGURE 3. Inside the BugEye with its “optical nerve” wires. 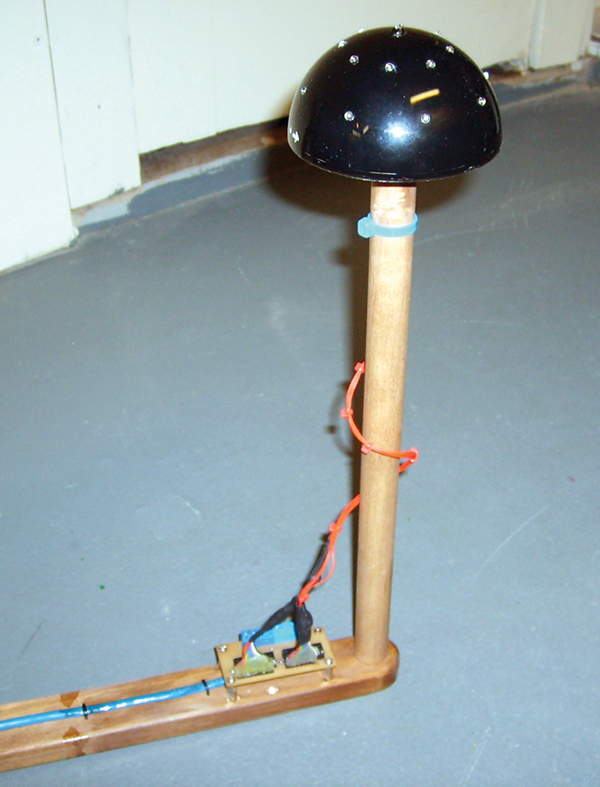 We started by designing an input device. How do you make a machine look for the sun? 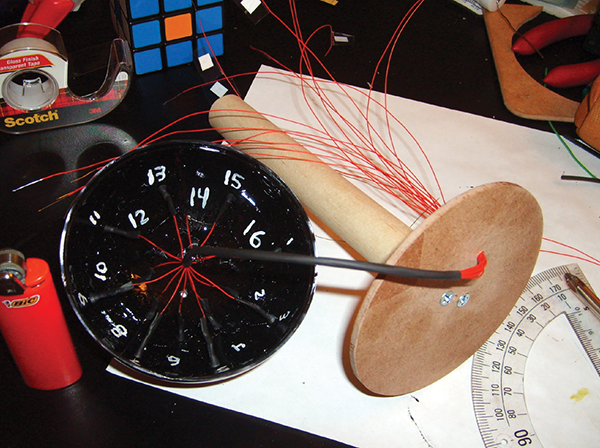 Why not build an analog eye (Figure 3)? We constructed a four inch diameter semi-spherical plastic dome with an array of 16 phototransistors evenly spaced about its surface (Figure 4). It appeared to be a multi-faceted bug eye, so that’s what we called it! Each of the 16 phototransistors was placed in series with a 330 ohm resistor between +5 volts and ground, creating 16 voltage divider circuits. FIGURE 4. The completed BugEye and Analog-to-Digital Converter (ADC) circuit. A voltage divider works using two parts: a fixed resistance (330 ohms) and a variable resistance (phototransistor). As any one phototransistor is exposed to light, a tiny current is produced at its base which causes an even greater current to flow from its collector to emitter. The more light focused directly at the phototransistor, the more collector current will flow. As the collector current increases, so does the voltage drop across the fixed 330 ohm resistor. There is only a total of +5 volts to be split between the resistor and phototransistor; so as more voltage drops across the fixed resistor, the greater the voltage drop ratio of resistor to phototransistor. This provides an analog measure of the amount of light that any one phototransistor sees. The area of the bug eye experiencing the greatest fixed-resistor voltage drops is the area hit most directly by the sun. That is how a machine looks for the sun! FIGURE 5. Two TLC0838CN 8-bit, 8 channel ADC chips on a homemade printed circuit board. FIGURE 6. A Parallax Basic Stamp II with 40 pins (BS2p40). FIGURE 7. Prototype of BugEye and ADC circuit. Depending upon how much light hit a phototransistor, a certain analog voltage would be measured on one of the 16 channels of the two ADCs. A binary (or digital) representation of that analog voltage would then be sent serially from the ADC to the BS2p40. The Stamp polled each of the 16 channels sequentially, stored their values, and then compared them to find the three greatest binary numbers ranging from 0 to 255. Why 0 to 255? Eight bits imply a resolution of 2^8 or 256 values. The three phototransistors with the largest voltage drops (and corresponding binary numbers) must therefore be the three pointed most directly toward the sun. And with that data, we knew the location of the light source. Adam started out with a really complicated neural networking scheme which would have given us amazing results. But due to the complexity of the neural network and project time constraints, Adam decided to water it down to the “triangle” method. In this method, he would program the BS2p40 to identify the brightest three phototransistors and calculate a weighted average based on their values. That would give him a point somewhere inside the triangle as a target for the panel. Unfortunately, graduation day was fast approaching, and time was running short. At the last minute, he ditched that method, as well. He finally calculated the servo positions (and their corresponding frequencies) for the midpoints of each triangle. This wasn’t as flexible as neural networking or weighted averaging, but it did the job. FIGURE 8. Solar Tracker coming together in the WVU Tech machine shop. During that last semester at WVU Tech, I probably got an average of two hours of sleep per night. I spent nearly every night (until the break of dawn) in the machine shop (Figure 8). Whenever my mind was free to wander throughout the day, I thought about this project. I rolled ideas round and round in my head, contemplating my designs from every conceivable angle. I was looking for flaws and trying to figure out the order of construction. Anyone who has ever designed a complicated machine knows that the order of construction must be strategically planned — lest you make a permanent, irreversible move only to realize that you should have done something else first. It’s agonizing, yet euphoric at the same time! It is creation, and it is wonderful; there is no better feeling! The three of us stayed up the entire night before the big presentation. An erroneous line of PBasic code pushed one of our servos beyond its mechanical limits, stripping the gears inside. Mike and I had to drive an hour away to pick up a replacement servo while Adam furiously rushed to complete the computer code. When we finally finished the solar tracker — just an hour before the presentation — we were exhausted! After showers and a quick change of clothes, we made a mad dash for the engineering building. We received many questions and compliments. Though bulky, heavy, and not nearly as efficient as it could have been, it worked! We each received an A in the course. When Dr. Goodman told me that this solar tracker was the quintessential Senior Design project, I felt that all of our hard work had paid off. FIGURE 9. 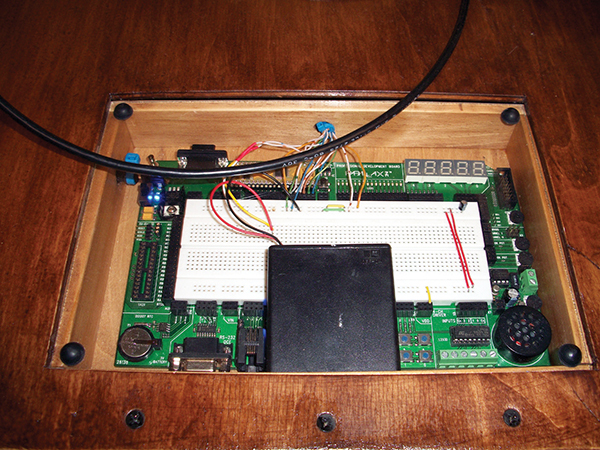 Glass cover plate over recessed BS2p40 microcontroller board. FIGURE 10. 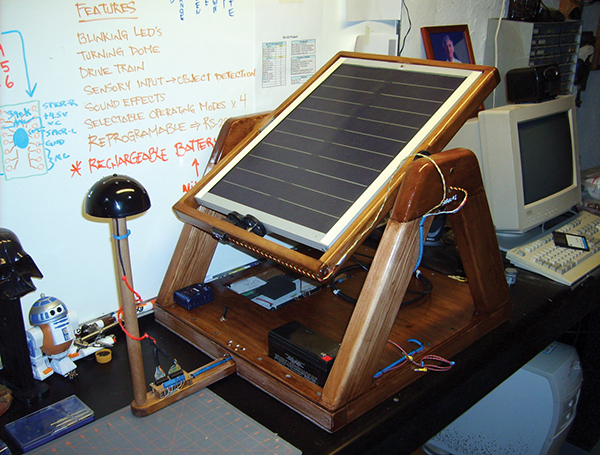 Finished Solar Tracker after some modifications in January 2009. In the process of writing this article, I was asked why we didn’t use linear actuators. To tell the truth, we hadn’t even considered it. 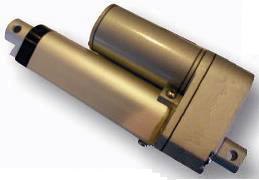 A rotary actuator with spur and pinion gears requires constant power to hold a fixed position, whereas a linear actuator with a screw or worm gear can hold its position without being energized — thereby consuming less power. Linear actuators might have been a good solution! Here’s how to make the conversion yourself: That’s 2.7 volts out of a maximum five volt reference; 2.7 divided by 5 equals 0.54 or 54%. Since we used eight-bit analog-to-digital converters, that means that the resolution of the binary value is 2^8 or 2x2x2x2x2x2x2x2 or 256 (values 0 - 255). Now, 54% of 256 is 138, but we say 137 since we’re starting at 0 instead of 1.